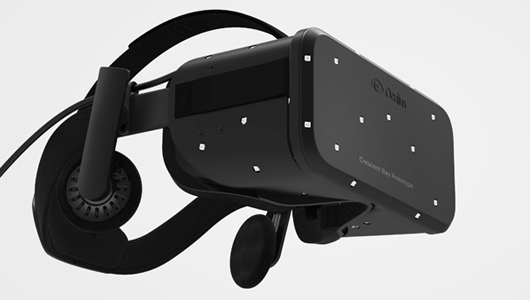 Oculus has unveiled a new model to their existing virtual reality headset christened, the Crescent bay. What makes it special is that it includes 360 motion tracking and integrated audio. The virtual reality headset wa s unveiled today in Occulus connect developer conference held in Los Angeles. The Crescent Bay, as you can see from the image above, comes with built-in headphones but this doesn’t mean that it wont be possible to use your own headphones. According to the CEO of Occulus, the device shown isn’t the final product yet but its close to becoming one. The latest model is much more lighter than its predecessor, has the same LED lights that we saw in Crystal Cove model, higher resolution, higher refresh rate better ergonomics and features 360 movement tracking. Moreoever, Occulus is developing their own audio tracking software which would be an integra part in the world of virtual reality. They have licensed RealSpace3D’s audio technology which would enable high-fidelity VR audio with a combination of integrated reverberation algorithms and HRTF spatialization.